Congress initiated liberalisation in 1991 with a new Industrial Policy. 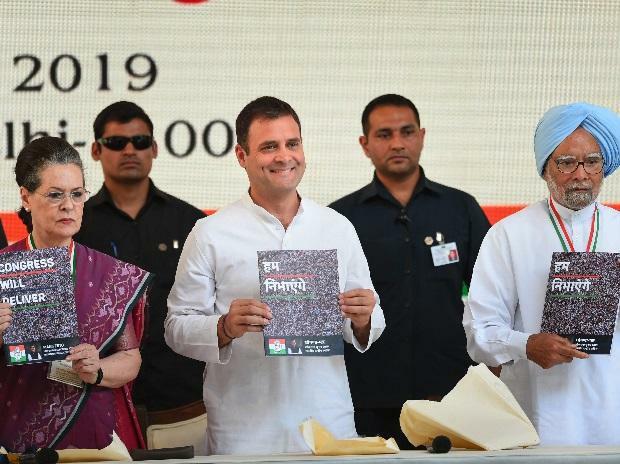 Taking note of the changes in the global economy and the Indian economy, Congress promises another radical, forward-looking Industrial Policy. The BJP Government mouths empty slogans. Its record is dismal in terms of the growth rate of Industry sector GVA and gross capital formation in the Industry sector. Congress promises to reverse these disappointing trends. Congress will announce a ‘Make for the World’ policy under which foreign and Indian companies will be invited to invest in ‘Exclusive Export-only Zones’, manufacture and export their entire production, pay no indirect taxes and pay a low rate of corporate tax. We will promote the manufacture and export of India’s traditional products like handloom products and handicrafts that employ lakhs of persons. 08. Congress will acquire patents, create a patent pool and make advanced technologies available to small and medium businesses. We recognise the need to create lakhs of low-skilled jobs in order to absorb young men and women who have completed only a few years in school. Congress will launch 2 major programmes to be implemented through Gram Sabhas and urban local bodies that will create 1 crore jobs: a. Repair and restoration of water bodies (‘Water Bodies Restoration Mission’); and b. Regeneration and afforestation of wasteland and degraded land (‘Wasteland Regeneration Mission’). Congress will require businesses employing 100 persons or more to start an apprenticeship programme, impart skills, pay a stipend, and employ from among the trained apprentices whenever a job is created or becomes vacant in that business. We will amend The Companies (Corporate Social Responsibility Policy) Rules, 2014 to include ‘Apprenticeship’ as an additional activity. We will identify new kinds of jobs that will emerge with the advent of new technologies and will offer opportunities to youth to acquire the skill-sets necessary for these jobs. A basic weakness of the Indian economy has been infrastructure. Flawed design, inefficient execution, insufficient capacity and poor maintenance of infrastructure have dragged India’s growth rate down. Congress promises to address these deficiencies with a combination of planning, technology, quality and accountability. All available models and instrumentalities will be used to build infrastructure—public sector, private sector and public-private partnership. Roads, railway and electricity are among vital infrastructure. They are also crucial public goods. Cities, Urbanisation and Urban Policy India is fast urbanising. Nearly 34 per cent of our population lives in towns and cities and the number is growing. As in the rest of the world, India’s cities can become engines of growth. The Smart Cities Mission of the BJP government, which replaced the successful JNNURM, was a colossal failure and a waste of money with no visible results. Congress promises to augment the total length of national highways and increase the pace of construction. The focus will be on improved design and quality, maintenance and accountability. Congress promises to massively modernise all outdated railway infrastructure. New projects will be implemented in accordance with the best international standards of design and quality. Road construction and railways can be built using private capital and capacity. Congress will use sector-specific, tried and tested PPP models to increase the supply of these vital public goods. Congress promises to review, re-formulate and implement the policy on spectrum and on exploration and extraction of natural resources. The policy will address issues of allocation, capital investment, enhanced production, transparency, efficiency, risk-reward concerns, environmental sustainability, inter-generational equity, accountability, competition and appropriate sectoral regulation. We will formulate a policy on Clean Energy in existing power plants that use fossil fuels and promote Green Energy to enhance the share of solar and wind energy in the total supply of energy.